COSTA MESA, Calif. (AP) — The Los Angeles Chargers have had to make plenty of adjustments this season on defense due to injuries and suspensions. They will have to make another with one of their leading tacklers lost for the remainder of the year. 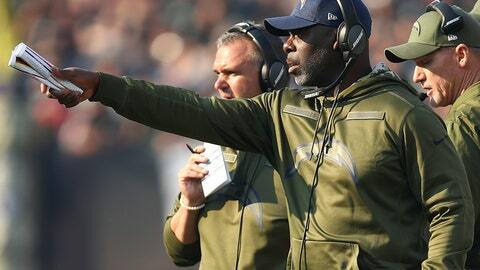 Coach Anthony Lynn said Monday that linebacker Denzel Perryman injured the lateral collateral ligament in his left knee during the first quarter of Sunday’s 20-6 win against Oakland and will undergo surgery. The 5-foot-11, 240-pound inside linebacker had started every game this season and was second in tackles with 51 going into the Raiders game. “It is definitely a blow to our defense. When Denzel is on the roster he is a difference-maker,” Lynn said. Perryman is one of the team’s top defenders against the run with 15 stuffs (tackles on running plays for no gain or a loss). Los Angeles is ranked 17th in the league against the run. It has allowed only one running back to rush for over 100 yards (the Rams’ Todd Gurley in Week 3) but the Chargers have been inconsistent. The Chargers are allowing an average of 133.8 yards per game on the ground over the past four games, which is 22 yards more than their season average. The one area where they have made improvement is in the pass rush. They have 15 sacks in the past four games and have four interceptions. “We have done a better job at stopping the explosive plays. As we stop passes going over our heads our defense has been playing a lot better,” cornerback Desmond King said. Perryman has been unable to remain healthy during his four years in the league. He missed four games in 2016 due to hamstring and knee injuries and did not play in the first eight games last season after suffering an ankle injury in the preseason. He was drafted in the second round in 2015 and is in the final year of his contract. Perryman is the second Chargers linebacker who has been placed on IR. Kyzir White, who started the first three games at one of the outside spots, was placed on injured reserve on Nov. 3 due to a knee injury. The team has not ruled out the possibility that he may return by the end of the year since it has not used its designated-to-return spot. Hayes Pullard and Kyle Emanuel, who both saw 16 snaps against Oakland, are in the mix to move into Perryman’s starting spot. Pullard started 10 games last season after being claimed off waivers and posted a career-high 79 tackles. Defensive end Joey Bosa has missed the season due to a foot injury, but he has made progress in his rehab. Lynn said Monday that there isn’t a timetable for Bosa’s return, but he did not completely rule him out for this week’s game against Denver. The Chargers have won six straight despite their injury woes, which is their longest winning streak since they took 11 straight in 2009.